RBI policy day ..increased volatility will be there . all above levels may work as entry stoploss and target levels depending on last traded rate of nifty and trend at that time if from 7929 nifty will start up move after a quick fall call will be buy at 7919 sl below 7902 and target 7948 if 7948 will breach then 7965 and so on . profit will be yours only when you are willing to pocket that in time ..if you wont book market may take it back in minutes traded from 2460 to 2489 and then 2489 to to 2449 …call was like this >>> 29 Sep 14, 11:22 AM [×] [o] admin: buy sbin f at 2460 sl 2434 tgt 2488 2546 http://prntscr.com/4rmq9d profit became zero after 2 hrs of negative move . accumulate jpassociat in 24 27 range for positional targets 41 55 64 74 with sl below 23.90 duration 6 to 24 months …Weekly chart looking attractive possible double bottom reversal expected . if reversed almost 100 % rebound may be there in coming 6 to 24 months . strong support but due to gap down may turn is strong resistance to come out of that bulls must clear it as early as possible . New month Fresh start ….we are planning to play ulta game reason is it is Friday every one will expect for Black Friday and try to sell his /her stuff but big players will encase this opportunity so why don’t you …buy at open on dips around 7940 50 keeping sl at 7918 . Please respect the trend and plan ur trades as per trend ..these levels are important support / resistance /pivot levels so u can plan ur entry long /short any where keeping sl below 1 level up or down for example ..
5620 traded bang on tgt call was 24 Sep 14, 08:39 PM [×] [o] admin: BUY cr oil at 5585 94 sl 5558 tgt 5619 http://prntscr.com/4pw2s4 gain hua 3000/- per lot se bhi jiadah kamaya kya ?? Make sure that you are planning trades with big stop loss order and for small gain …do not see risk and reward …wide sl will protect your trade from premature exit and you will exit at gains for sure if you will plan your trade in the direction of trend so first spot trend then go for trade and then for gain . 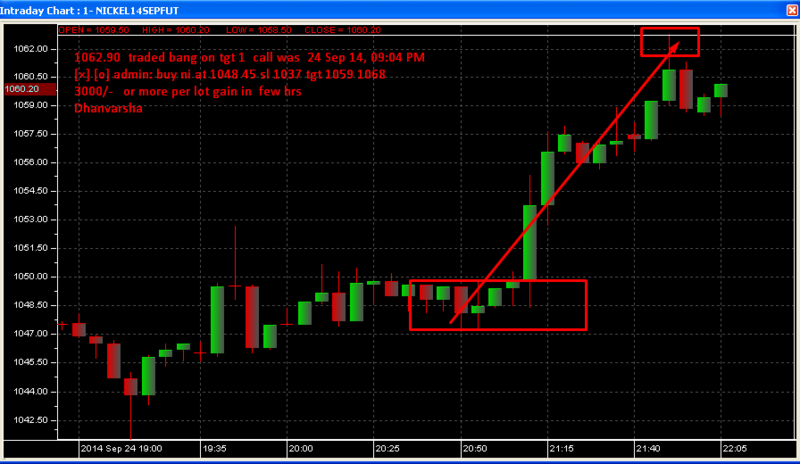 Gap down of 15 20 points is expected so first of all pocket your profits on btst / stbt trades . for NF book gains below 17 points for bnf below 55 points and for sbin icici below 0.5 % . same for 8000 call book below 120 and put 8150 book gains above 36…either book gains or lock your gains by placing stop loss order at advised levels . at expiry time do not stay in trade without stoploss order …u may plan wider stop loss order from 0.1 0.3 % according to your risk ..
best way will be exit at sl level and if trade will move in trade direction u may re enter in same trade ..
Do not wait or play for last / final target play only for target 1 .as each and every level is very strong support / resistance level / pivot point ..means if 1 will break then next may come if will not break then either stock may stay at that level or bounce back . Nifty moved up from 7630 to 8180 at one go and from there 38.2 % retracement as per fib upto 7925 provided technical support so nifty bounced up.. now well prepared to breach 38 % level as seeing red spinning top at eod chart confirming bucking of momentum you can see nifty trading at 7852 soon if this chart is correct and if bears will take over 7928 easily with volumes ..Nifty will be gud to buy only above 8150 for higher target of 8300 8400 below that sell on rise and book profits at swing lows as we have started at Dhanvarsha . expecting expiry at 8000 plus minus 30 as per nifty options OI analysis ..
Flat to positive opening is expected with choppy session ahead …profit booking and short initiation at higher levels cannot be ruled out ..stay online and accumulate shorts below 8165 keep sl at and above 8167 .. .
[×] [o] abhishek: SELL nf at 8062 add more at 8089 sl 8106 tgt 7964 —-SL triggered! some more losses are here which are not updated by members but no one updated more than Rs 8000/- loss on his / her trade means all are trading with discipline and placing stop loss orders . so it is time to book gains on your btst /stbt trades . many calls were shared in real time at http://dhanvarsha.in/chatroom/ Free chat room . You can learn positive trading and chart reading online while sitting at your home / office join dhanvarsha for that ..
[×] [o] admin: IDFC traded below 142 bang on target gained 14000/- or more per lot in 2 sessions call was 16 Sep 14, 09:29 AM [×] [o] admin: SELL idfc f at 149.00 sl 151.60 tgt 147.30 >>>142.10 dhanvarshahttp://prntscr.com/4nvl2a 2 din men itta saara ??? will 7800 break this week at spot Nifty ? [×] [o] tej: Sir i earned 12500 in ICICI. Thanks for your amazing tips..
Plan your trades seeing stoploss risk , book full profit near target1 in range bound market and move your sl to next level when trend will be there means adopt trailing sl technique . nearest support for bn at 15455 and if it will break then go for 13400 …2000 bn points agar gaye to kya hoga nifty ka level ..
Do u want to learn and earn 1 saath ?? we are here to assist you 24 x 7 support . personal counselling … chart reading ..prediction of possible targets and stoploss orders . gap down we are expecting panic selling …recovery chances are negligible …sell on rise and book gains at low ..
other options are also there if your dil mange more then go to premium page pay something from your earnings and bas ..
Dhanvarsha planned sell on all these at higher levels …The market valuation of top five Sensex companies fell by Rs 36,971.61 crore last week, with ONGC BSE -0.05 % and Sun PharmaBSE -2.05 % being the worst hit. in coming 3 to 4 months ? a rising wedge is a bearish pattern that signals that the security is likely to head in a downward direction. The trend lines of this pattern converge, with both trend lines slanted in an upward direction. Again, the price movement is bounded by the two converging trend lines. As the price moves towards the apex of the pattern, momentum is weakening. A move below the lower support would be viewed by traders as a reversal in the upward trend. As the strength of the buyers weakens (exhibited by their inability to take the price higher), the sellers start to gain momentum. The pattern is complete, with the sellers taking control of the security, when the price falls below the supporting trend line. eod nifty chart is showing same pattern …try to read it if it is true then possibility of trend reversal is increased be cautious . then advised to buy it and see the result ..
so sell and buy both calls worked … why don’t u plan like this ? if you are not familiar with with trends stop losses and expected target prediction or on line trading also don’t feel shy …join Dhanvarsha now and learn online ..
Bulls will be back only above 8160 65 …. Below that bears will dominate . day before yesterday it was advised to short nifty at 8200 8190 during pre market hours and Nf started its day above 8190 traded at 8200 and yesterday traded at 8107 means allowed to book 93 points gains…have a look ..
admin: gap down opening is expected with initial choppy then sell on rise mood so advised to sell nf at 8145- 8164 sl 8172 ..sell as high as u can but sl to be kept at 8172 ..those holding stbt nifty may book profit below 8145 and place sell again at 8158 60 level.. possible targets / levels will be 8145 8122 8103 8081 8061 8036 you will get more updates during market hours ..
what we are expecting now?? flat to negative opening …choppy session means traders are still confused so book small small gains ..means minimum 1500 Rs per trade if you are risking 25 to 30k capital on intra trade …if you are not getting that much of amount ..let stop loss will get triggered . EOD nifty chart is showing red candle ..red means red …not blue hope you are trying to understand what is red and its meaning . as per levels and with stoploss ..